The stamp set I've used today is just gorgeous. Its one of the hostess sets that you can earn from qualifying orders from Stampin' Up! annual catalogue. I absolutely adore this colour combination, I first saw it used in a project on a fellow demonstrators blog - my friend and fellow Pinkie Sarah Berry. 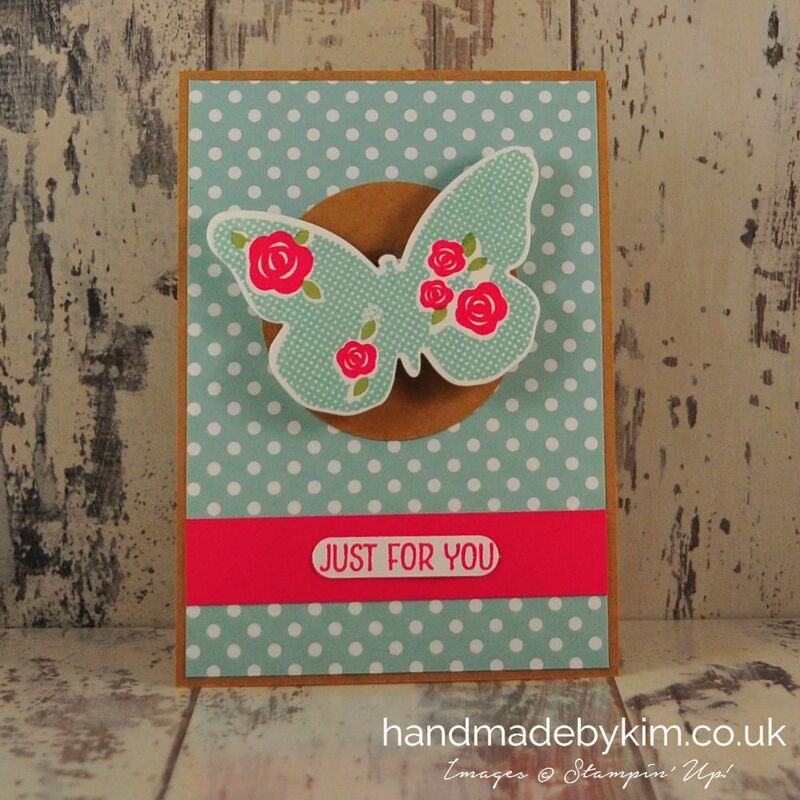 Click here for a peek at her fablous project using the same stamp set and the same colours. Naturally when I came to use this set for the first time I couldn't think of any other colour combination to use except for this one - I've used Pool Party, Melon Mambo & Old Olive. It has a Cath Kidston look about it, don't you think? 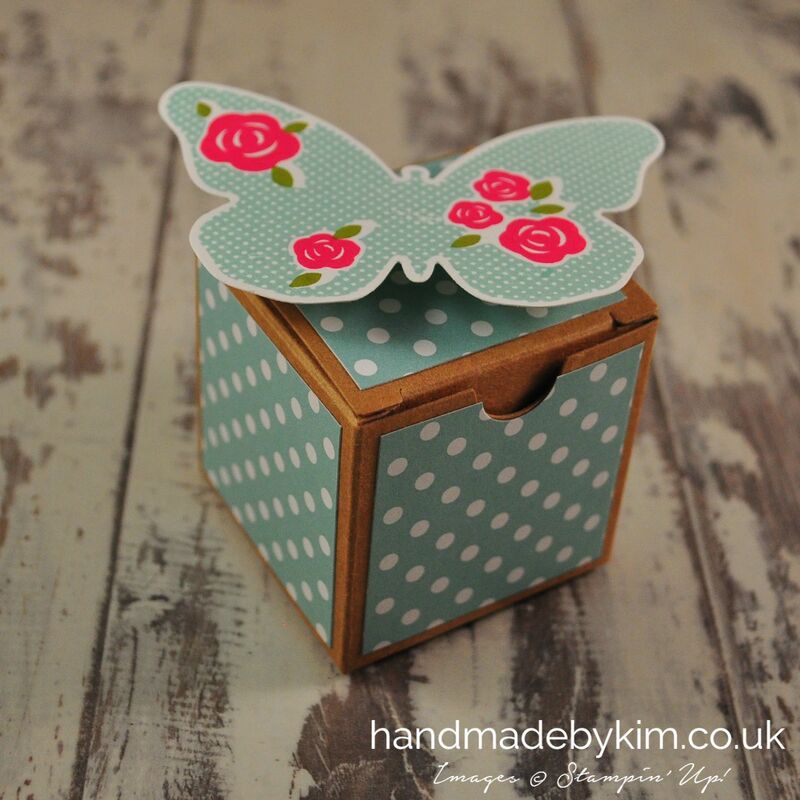 These little boxes can be purchased ready to make from my online shop, they are great for a last minute gifts or favours and are perfect for holding little treats such as chocolates & sweets, jewellery or even a small candle. I've decorated mine to match the card with the polka dot pattern from the Subtles Designer Series Paper Stack. Photopolymer stamps are perfect for the Floral Wings stamp set set as you need to be able to see through the stamp to achieve perfect 3 layers of stamping. I started with Pool Party Ink for the main butterfly shape and image, then stamped the flowers in Melon Mambo, finishing off with the leaves in Old Olive. The effect is striking and I love it. 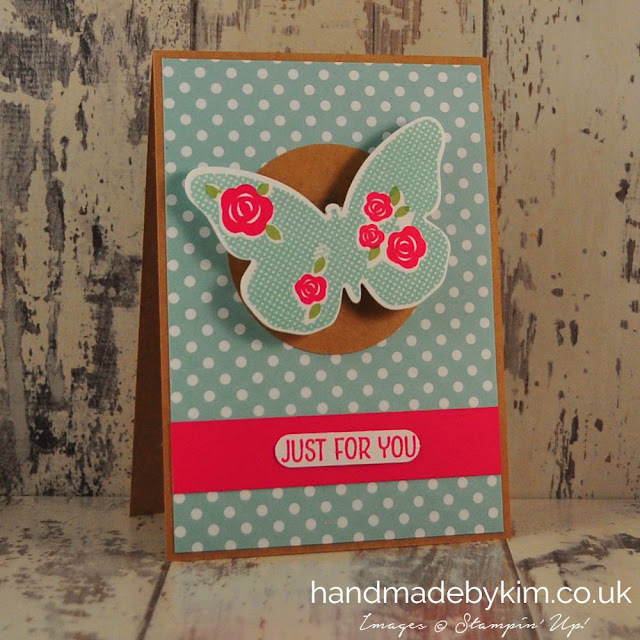 I used the large butterfly die from the Bold Butterfly Framelits Dies to cut out the butterly. I used my magnetic plate with my big shot to make sure the framelit didn't move. These framelits also coordinate with the Watercolour Wings stamp set, which is amazing. I think the framelits are well worth investing in as you can use them with several coordinating sets for lots of different looks. Just before I go...... I know its completely impossible to tell from my picture, but I wanted to tell you all about what I've used to add something a little different to my project. Its called an Action Wobble Spring. I've used this spring to attach the butterfly to the card. It not only gives the butterfly a 3D effect, it also allows the butterfly shape to move slightly with a fun wobble motion. We used one of these for the first time at the quarterly training event in July so I've been waiting for an opportunity to use one of these in my projects. Check out this short video to see what they are all about. Thanks for stopping by - come back on Saturday for my first Halloween themed project.